If you've ever tried float flying, you probably love it. If you haven't tried it, do so ... soon! While the activity is great, it can be mighty expensive. Amphibious floats for a Cessna 182, for example, probably cost more than a brand-new LSA. So how does a company make this more affordable? Check out this video and get an education about a much more modestly price float set on a very popular airplane, the CubCrafters Sport Cub. If you’ve ever tried float flying, you probably love it. If you haven’t tried it, do so … soon! While the activity is great, it can be mighty expensive. Amphibious floats for a Cessna 182, for example, probably cost more than a brand-new LSA. So how does a company make this more affordable? Check out this video and get an education about a much more modestly price float set on a very popular airplane, the CubCrafters Sport Cub. 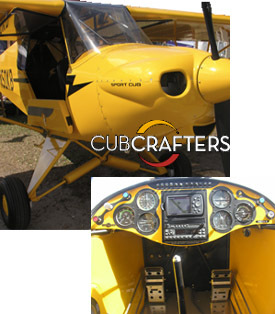 CubCrafters is a well-established company that retores vintage Cubs, makes the FAA Type Certificated Top Cub, and is one of our LSA market leaders with their SportCub. This may look like a replica Cub but is actually a thoroughly modern version as evidenced by significant use of carbon fiber to stay with the LSA empty weight limit. In the chart above, the Top 20 companies represent going businesses. Companies with enough registered aircraft to qualify for the Top 20 but which are insolvent or inactive were removed to present a truer picture of the current fleet of active companies. While most of the LSA industry — as with most of aviation — endures unprecedented slow sales, at least two companies are showing reasonably good 2010 performances. *** Washington-based CubCrafters is the clear market leader for the first seven months of 2010, with 27 new registrations. We repeat, as always, that FAA registrations do not equal sales; individual company statistics may be different. Following CubCrafters is CSA's PiperSport with 18 new registrations and Flight Design with an even dozen. *** All the Big Six companies remain the same — in their rank for the entire LSA fleet — though some shifting occurred: Flight Design; American Legend; CubCrafters (moving from 4th to 3rd ranked); Tecnam (3rd to 4th); Czech Sport Aircraft (builder of the PiperSport, 6th to 5th); and Remos (5th to 6th). These Big Six all have more than 100 registered airplanes in FAA's database, though they are trailed by only a few airplanes by Jabiru USA and Evektor. AMD and TL Ultralight (up to 9th from 10th) are in a third tier of the top ten. *** Two companies advanced into the Top 20 rank positions for the first time: Paradise; and airplane manufacturing giant, Cessna. Other brands to watch include Arion, and FK Lightplanes. *** Of the three companies with the most action this year, CubCrafters has moved forward smartly. Flight Design is always a contender. But the main one to watch closely may be Piper. According to LSA project manager Russ Greenberg, the company is "on track to meet our January forecast of 75 airplanes sold in 2010." Though their FAA registrations show 18 for the year, Piper reported 40 sales consummated by AirVenture 2010. If the company hits their target and if all were registered in 2010 (unlikely), PiperSport-producer CSA could dislodge American Legend in the number two spot. However, forecasting the future is hazardous at best; for true information we'll have to wait for the final answer just before January's Sebring LSA Expo. While most of the LSA industry — as with most of aviation — endures unprecedented slow sales, at least two companies are showing reasonably good 2010 performances. *** Washington-based CubCrafters is the clear market leader for the first seven months of 2010, with 27 new registrations. We repeat, as always, that FAA registrations do not equal sales; individual company statistics may be different. Following CubCrafters is CSA’s PiperSport with 18 new registrations and Flight Design with an even dozen. *** All the Big Six companies remain the same — in their rank for the entire LSA fleet — though some shifting occurred: Flight Design; American Legend; CubCrafters (moving from 4th to 3rd ranked); Tecnam (3rd to 4th); Czech Sport Aircraft (builder of the PiperSport, 6th to 5th); and Remos (5th to 6th). These Big Six all have more than 100 registered airplanes in FAA’s database, though they are trailed by only a few airplanes by Jabiru USA and Evektor. The ranking order changes again even while the top three hold their leadership positions. 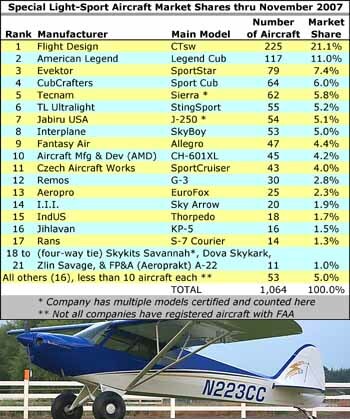 Note the gain of CubCrafters now brings the sum of little yellow taildraggers (with American Legend and Zlin's Savage) to an impressive 17.3% of all fixed wing registrations. The U.S. economy is hardly crashing, but while slipping backwards in late 2007 and early 2008, it has been on a bumpy plateau. This unevenness causes trouble for many businesses. Even giant coffee seller, Starbucks, is rejiggering their business model to adjust for folks balking at $4 coffee while their stock portfolio lurches up and down. Light-Sport Aircraft sales also reflect that lack of consumer confidence. *** Figures for the first two months of 2008 show slightly more than 40 aircraft registrations per month. In 2007, the industry averaged 47 aircraft registrations per month. Of course, this 15% decrease also comes while many northern states have endured awful winter flying weather, partially explaining why sales are off the beat. Despite a cloudy overcast some bright spots emerge. *** CZAW's SportCruiser led the pack with more than 17% growth during January and February. AMD is close behind with 14% growth, and CubCrafters continues their climb with 7.5% growth. 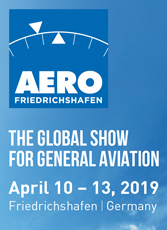 Newly ranked companies appearing on the list include Gobosh (G-700S) and U.S. producers Just Aircraft (Highlander) and Higher Class Aviation (Sport Hornet). Common in every industry, larger companies have difficulty maintaining high percentage growth as their overall numbers increase. The U.S. economy is hardly crashing, but while slipping backwards in late 2007 and early 2008, it has been on a bumpy plateau. This unevenness causes trouble for many businesses. Even giant coffee seller, Starbucks, is rejiggering their business model to adjust for folks balking at $4 coffee while their stock portfolio lurches up and down. Light-Sport Aircraft sales also reflect that lack of consumer confidence. *** Figures for the first two months of 2008 show slightly more than 40 aircraft registrations per month. In 2007, the industry averaged 47 aircraft registrations per month. Of course, this 15% decrease also comes while many northern states have endured awful winter flying weather, partially explaining why sales are off the beat. Despite a cloudy overcast some bright spots emerge. *** CZAW‘s SportCruiser led the pack with more than 17% growth during January and February. AMD is close behind with 14% growth, and CubCrafters continues their climb with 7.5% growth. The S-LSA Useful Load Requirement The FAA sport pilot/light-sport aircraft regulations define a light-sport aircraft; however, those limitations aren't the only requirements that manufacturers must abide by in producing special light-sport aircraft (S-LSA). Recall that the FAA empowered the industry and community through ASTM International to develop consensus standards to regulate the design, manufacture, and production of LSA rather than FAA-mandated standards such as Part 23. FAR 21.190 requires that the aircraft be designed and manufactured in accordance with the standard. A part of the design standard is a useful load requirement. Currently that requirement is 430 pounds for fixedwing airplanes (land). That number was arrived at by allowing 190 pounds for each seat occupant (380 pounds for two-seat S-LSA), and one-half the horsepower in pounds (for example: with a 100-hp engine add 50 pounds). Accordingly, any fixed-wing S-LSA that has an empty weight of more than 890 pounds (with all options added) is being manufactured and operated in violation of the ASTM standard. Buyers of S-LSA are advised to determine whether an S-LSA meets this standard before purchasing or operating it. Bottom line: Don't buy a new S-LSA that has an empty weight greater than 890 pounds. FAR 91.327 requires that S-LSA be produced and operated in accordance with the consensus standards. Once an S-LSA is purchased, it is the owner's (and operator's) responsibility to keep the airplane in compliance with the standard. 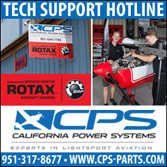 Any alteration or addition of equipment must meet the applicable and current consensus standard and be approved by the manufacturer or an FAA representative. Note that experimental LSA (E-LSA) or experimental amateur-built aircraft operated by sport pilots do not have this limitation. The S-LSA Useful Load Requirement The FAA sport pilot/light-sport aircraft regulations define a light-sport aircraft; however, those limitations aren’t the only requirements that manufacturers must abide by in producing special light-sport aircraft (S-LSA). Recall that the FAA empowered the industry and community through ASTM International to develop consensus standards to regulate the design, manufacture, and production of LSA rather than FAA-mandated standards such as Part 23. FAR 21.190 requires that the aircraft be designed and manufactured in accordance with the standard. A part of the design standard is a useful load requirement. Currently that requirement is 430 pounds for fixedwing airplanes (land). That number was arrived at by allowing 190 pounds for each seat occupant (380 pounds for two-seat S-LSA), and one-half the horsepower in pounds (for example: with a 100-hp engine add 50 pounds). Accordingly, any fixed-wing S-LSA that has an empty weight of more than 890 pounds (with all options added) is being manufactured and operated in violation of the ASTM standard. CubCrafters Debuts 'Carbon Cub' Proof Of Concept CubCrafters debuted its Carbon Cub proof-of-concept aircraft at the 2007 Alaska State Aviation Trade Show and Conference in early May. The company says the 220-hp aircraft is a platform for a host of new airframe construction materials, performance options, design improvements, and more powerful engine options. The aircraft does not currently meet light-sport aircraft certification requirements, but the company says the nearly 40 airframe parts made out of high-strength carbon fiber saved 250-300 pounds compared to a Super Cub with the same equipment. The project points toward several new aircraft possibilities for CubCrafters including a light-sport aircraft certificated as a factory-built airplane, a homebuilt kit plane, and/or a new FAA certificated airplane. For more information visit www.CubCrafters.com. Power for the Sport Cub is a 100-hp Continental O-200 engine, with either a Sensenich wood propeller or optional McCauley metal prop|appropriate for those folks planning to put the Sport Cub on floats. The Sport Cub has a traditional bungee cord suspension system, but it's dressed up a bit with covers to keep dirt and debris out. The "office" of the Sport Cub features a traditional side throttle along with fuel selector switch. While this particular Sport Cub is equipped with an optional full glass panel, CubCrafter's offers a more traditional panel. To accommodate folks of Jim Richmond's height, the Sport Cub's cockpit is 30 inches wide and 52 high. Jim Richmond demonstrates the technique. ... resulting in a large storage area that can hold up to 100 pounds of cargo (if within weight and balance limitations). Vintage Looks Mated With Modern Materials Take 25 years of experience with rebuilding Piper Cubs, add a new FAA regulation allowing more flexibility in designing and producing aircraft, spice the mixture with many design changes, and you get CubCrafters' Sport Cub. The Yakima, Washington-based company has created an airplane that retains the vintage look of a J-3 Cub but embraces 21st century materials and technology. On a warm evening during the Sun 'n Fun Fly-In at Lakeland, Florida, I flew with CubCrafters' pilot Clay Hammond. He identified company President Jim Richmond as the primary motivator behind the Sport Cub. Richmond has been rebuilding Cubs for 25 years, during which time he conceived many changes he wanted to try. Taking into consideration his height-he's 6 feet 4 inches tall-he wanted to make all the improvements he'd envisioned for the venerable Cub, and he wanted the airplane to fit him. A Thoroughly Modern Cub CubCrafters took on the redesign of the 50-year-old airplane using modern materials and engineering software not available to Piper engineers when the J-3 was created. The result is a stronger, lighter weight fuselage structure. 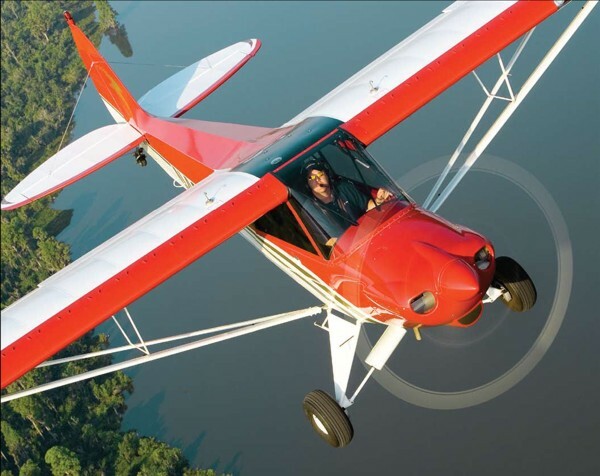 CubCrafters Vice President Todd Simmons said the company made extraordinary efforts to lighten the Sport Cub's airframe to stay within the maximum gross weight allowed for light-sport aircraft (LSA)-that's 1,320 pounds for landplanes and 1,420 pounds for seaplanes. One example of this effort is a cowling built of composite materials instead of aluminum. Additionally, the Sport Cub's wingtips have a carbon fiber component that sweeps from a D-cell shape to a tubular shape at the trailing edge. The Sport Cub's main fuselage structure uses composite stringers for shaping where cosmetic finish is the goal. Wherever structural strength is important, CubCrafters uses steel or aluminum. In many places where a steel part might be used, the Sport Cub uses a machined aluminum billet fashioned into a specialized part, according to Clay. The effort was made in the interest of saving ounces, but the parts are beautiful. At the base of the Sport Cub's joystick are handsome aluminum machined fittings that function as ailerons linkages. Overall, the Sport Cub exhibits excellent finish work from the machined parts to the beautiful paint job. Clay attributed that to Richmond's many years of involvement with this airframe. Poly-Fiber coverings and coatings are used to the silver finish stage, with PPG paint used for the attractive final finish. The Sport Cub manages to preserve the image of an original Cub while delivering an all-new design with significant redesign work to address ASTM standards. Retro automobiles like the Thunderbird also hark back to the familiar models of yesteryear yet add new construction technology to the mix. Appropriate to the Sport Cub's contemporary premise, the entire plane was created with SolidWorks engineering software. The final evidence of CubCrafters' work to shave weight wherever possible is that Sport Cub number one, N468CB, has an empty weight of 877 pounds according to the pilot's operating handbook in the airplane. That weight would permit another 13 pounds of equipment and yet still be within the ASTM standards requirement that all S-LSA have a minimum useful load of 430 pounds. Most original Cubs had no electrical systems, but the new millennia Sport Cub does, to accommodate avionics and a built-in landing light in the wing. And it has two 12-gallon fuel tanks located in the wings. The Feel Is Real Similar to authentic Piper J-3s, the Sport Cub has no door on the left side. In exchange for entry there's a broad window offering good lateral vision and a somewhat aft view. The windshield is also large as it extends into a skylight, which adds lateral visibility in turns. Open-cockpit flying lovers can rejoice. The Sport Cub's windows and door may be opened at any time during flight. However, Clay indicated that if you are "tached up" (that is, the engine revving high), it gets pretty windy inside. He sets power at about 2100 rpm to have a better open-cockpit flying experience. Why fly with the windows open at the highest speed the Sport Cub can muster, especially considering how well it slows down? The Sport Cub's floorboard is a single piece of fiberglass that is built into the airplane as it is assembled; it lends a quality finish and coordinates well with the handsome machined parts. The aft, hammock-style seat can be folded up to effectively become part of the headliner. Once it's stowed properly, the back area opens up for other uses. The Sport Cub can be loaded with 100 pounds in this aft area plus another 20 pounds in the hat rack, assuming the cargo is well secured and remains within the weight and balance envelope. This aft area's versatility adds value to those wishing to use the Sport Cub as a bushplane. To improve support when used by a passenger, carbon-fiber pieces are added to lend structure. A cushion goes on top of the basic seat for additional comfort. Our test Sport Cub had a sturdylooking Aircraft Spruce tail wheel. However, bush pilots will want to upgrade to the optional Scott tail wheel, which puts more surface on the ground. The Sport Cub's landing gear has a bungee cord suspension like original Cubs, though the cords are modernized with a fairing cover. Slow-Flying Delight Here's my confession: I'm a longtime ultralight pilot who appreciates the ability to fly slowly over the landscape. When I discovered the great slow-speed qualities of the Sport Cub, I knew I'd like it for low-and-slow flying. On landing, we used one notch of flaps and powered back substantially abeam the landing point. We used 65 mph on base leg and 55 mph on approach. These comfortably low numbers are merely a baseline. Clay said when flying solo, well under gross, he can approach safely at 45 mph (39 knots), which allows landings in small spaces. The Sport Cub's optional flaps have a noticeable effect when you deploy them. The first notch of flaps, normally deployed at a higher airspeed, caused a significant pitch change. To best operate these flaps, you first relieve the pressure on the flap handle before deflecting the detent release with your thumb. When adjusting to a new setting, you first move the lever slightly and then engage the detent tab. Flap forces were light, making this an easy adjustment. Clay described a technique he uses if he wishes to loiter in the pattern, perhaps to allow traffic ahead more spacing. He puts down full flaps and enters slow flight, dropping the airplane to 28 mph while holding altitude. My own test of this technique quickly gave reassurance that it's possible. The Sport Cub slows down marvelously. Despite a good bit of taildragger experience, I bounced slightly on my early landings. There was a brisk crosswind at South Lakeland Airport during my evaluation flight. In such conditions, Clay likes to execute wheel landings. Therefore, I did likewise, though my usual method is the fullstall landing on three points of a taildragger. Clay's technique is to come in tail low and plant the mains fairly authoritatively. Once the mains are on to stay, he eases the stick forward to maintain this posture. I tried this technique to achieve my best landing of the bunch. While taxiing, I was pleasantly surprised to find that you can see over the nose quite well despite the taildragger deck angle, and the Sport Cub's brakes proved potent. 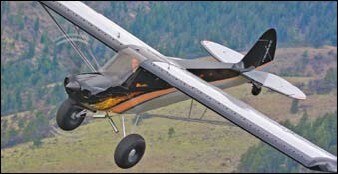 You can break loose the tail wheel to pivot on the mains once your technique is sufficiently practiced. My Dutch roll coordination exercises went well from the start. Over the years, I've found this to be a reliable way to judge overall control authority, response, and harmony. Many airplanes require a few hours of experience to appreciate their fine points; others come quickly, and the Sport Cub is in the latter group. However, I found the joystick seemed a bit heavier in control motions contrasted with the powerful rudder pedals. As cleanly executed as the joystick hardware was, the stick became rather slippery in my hand; I'd prefer a more tactile grip. Fashioned out of an aluminum tube, the diameter was thin and thus difficult to hold. Steep turns done at 2500 rpm (about 75 percent power) required no additional power to hold altitude, and I did not have to change trim to sustain the turn. In the steep turn without a trim adjustment, I found a fair amount of stick backpressure was required, but I was easily able to hold the turn to within 100 feet of deviation through two full circles. This was true in either direction. Stalls in all simulations worked without surprise. Given the Sport Cub's wonderful low-speed capability, I expected stalls would be docile, and they were. My longitudinal stability check went equally uneventful as well. The same can be said for power response checks with no sustained oscillation before the Sport Cub responded in the correct direction. At 2450 rpm, approximately 65 percent power, I saw about 88 mph (76 knots) on the airspeed indicator. At this power setting Clay believed fuel consumption would be about 5 gph. Bumping power to 75 percent would raise the burn rate to 5.5 gph, he thought, and speed climbed into the low 90s. In a timed descent checked through 120 seconds, I saw a sink rate of about 420 fpm. With the engine idling and producing plenty of drag, this qualifies as excellent in the LSA category. Later in the day, with conditions mellowing, the vertical speed indicator confirmed this idle-power sink rate. As you look over the Sport Cub, you'll notice vortex generators on the wings' upper surface. They contribute to its slow speed flying capability but set the CubCrafters' version apart from other LSA Cubs in one more way. Though Cubs are known for their highlift wing, the generators do a good job. On his departure to the Plant City airport, Clay demonstrated a short takeoff roll in the Sport Cub flown solo after the heat of the day passed. I estimate he was off in less than 150 feet. 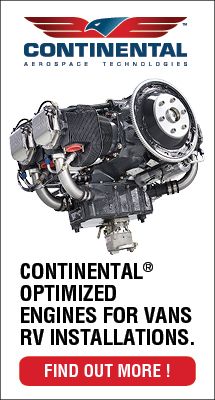 I also noticed that the Continental engine is considerably noisier than a Rotax lifting a similar weight. Top-of-The-Line Cub The Sport Cub is nicely finished, but that heightened level of professionalism comes at a price premium. The base price of the Sport Cub is listed at $99,500 in spring 2007. But that doesn't include the flaps I used ($6,500), the twin fuel tanks (12 gallons is standard; 24 gallons will cost $1,700), or all the panel goodies. Nonetheless, a base-price Sport Cub is a well-equipped machine. On the panel you get an airspeed indicator, altimeter, compass, tachometer, oil temperature gauge, oil pressure gauge, inclinometer, and Garmin SL40 VHF communications transceiver. If you want GPS and glass instrumentation, you can spend $10,000 to $20,000 more. An intercom adds another $1,000. If you want colors other than the "standard Cub" look, optional paint adds $2,900, and the obligatory emergency locator transmitter adds $1,100. The Sport Cub I tested would approach $130,000 in price. But for this premium, you get an airplane essentially built in a Part 23 environment, the same as used by Cessna, Cirrus, and Diamond. You also get an airplane that complies with the ASTM useful load requirement. In fact, Cub- Crafters "prices" the Sport Cub in dollars and pounds. The ASTM standards for LSA call out a minimum useful load of 430 pounds; that value subtracted from the maximum gross weight of 1,320 pounds means no 100-hp two-seat SLSA landplane can weigh more than 890 pounds empty. Buyers have a reasonable duty to examine an S-LSA's weight and balance information to assure any plane that interests them actually meets ASTM guidelines. With its base price equipment, CubCrafters says the Sport Cub will weigh only 825 pounds empty, as a result of the company's extensive effort to keep weight down. With the basic options I specified above, the Sport Cub should weigh 856 pounds, well under the 890-pound maximum. This means if you simply must have more options, CubCrafters has planned well and worked hard to allow you make your Sport Cub the Cub you want. Reflecting on the care and long experience used by CubCrafters to create its LSA, you realize not all Cubs are created equal. If you are a particularly demanding buyer, the Sport Cub should make a great choice for you. Get informed via the company's website, and then get a demo flight. A Sport Cub might look good in your hangar. 2 See article for more consumption info. Vintage Looks Mated With Modern Materials Take 25 years of experience with rebuilding Piper Cubs, add a new FAA regulation allowing more flexibility in designing and producing aircraft, spice the mixture with many design changes, and you get CubCrafters’ Sport Cub. The Yakima, Washington-based company has created an airplane that retains the vintage look of a J-3 Cub but embraces 21st century materials and technology. On a warm evening during the Sun ‘n Fun Fly-In at Lakeland, Florida, I flew with CubCrafters’ pilot Clay Hammond. He identified company President Jim Richmond as the primary motivator behind the Sport Cub. Richmond has been rebuilding Cubs for 25 years, during which time he conceived many changes he wanted to try. Taking into consideration his height-he’s 6 feet 4 inches tall-he wanted to make all the improvements he’d envisioned for the venerable Cub, and he wanted the airplane to fit him. A Thoroughly Modern Cub CubCrafters took on the redesign of the 50-year-old airplane using modern materials and engineering software not available to Piper engineers when the J-3 was created. 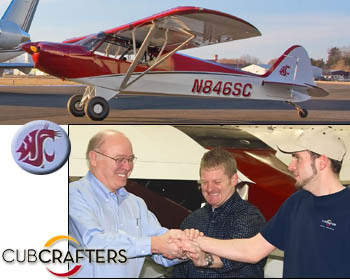 Scott Carson is an alumni of Washington State University so CubCrafters offered the Boeing executive a custom paint job honoring his alma mater. Carson (left) shakes hands with Todd Simmons, CubCrafters President and company A&P Jason Bass, whose grandfather worked for Boeing. Who in the Light-Sport Aircraft business wouldn't like to log a sale to the President and CEO of Boeing Commercial Airplanes? CubCrafters made such a delivery yesterday when they presented a special Sport Cub S2 to Scott Carson. The 34-year Boeing veteran makes the big planes by day and can now fly his Light-Sport Aircraft on the weekends. He'll also fly the colors of his alma mater of Washington State University (photo). To pick up his S2 Carson returned to Yakima where he grew up in the late 1940s. His dad worked for Lamson Aircraft, builder of the Air Tractor, a biplane crop duster. Carson's father later joined Boeing as a test pilot. *** Todd Simmons of CubCrafters observed that his company and Boeing are the only two aircraft builders in Washington with a production certificate. "We're Washington's 'other airplane manufacturer'," Todd said. The Sport Cub builder offers two all-new, FAA-certified, ready-to-fly aircraft: the second generation Sport Cub S2 and Top Cub. The latter is built under Part 23 rules and includes an FAA Production Certificate. 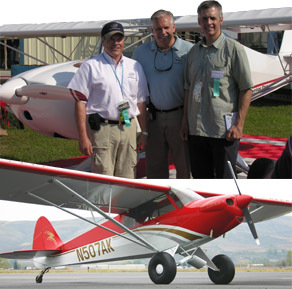 In 2007, CubCrafters reported producing a combined-model total of nearly 100 new aircraft; Sport Cub tripled its numbers and lifted the Washington producer to number five in LSA market share. Who in the Light-Sport Aircraft business wouldn’t like to log a sale to the President and CEO of Boeing Commercial Airplanes? CubCrafters made such a delivery yesterday when they presented a special Sport Cub S2 to Scott Carson. The 34-year Boeing veteran makes the big planes by day and can now fly his Light-Sport Aircraft on the weekends. He’ll also fly the colors of his alma mater of Washington State University (photo). To pick up his S2 Carson returned to Yakima where he grew up in the late 1940s. His dad worked for Lamson Aircraft, builder of the Air Tractor, a biplane crop duster. Carson’s father later joined Boeing as a test pilot. *** Todd Simmons of CubCrafters observed that his company and Boeing are the only two aircraft builders in Washington with a production certificate. “We’re Washington’s ‘other airplane manufacturer’,” Todd said. The Sport Cub builder offers two all-new, FAA-certified, ready-to-fly aircraft: the second generation Sport Cub S2 and Top Cub. Chart shows registrations through eleven months of 2007. One star of 2007 is CubCrafters and their Sport Cub (photo), which more than tripled its registrations. Other 2007 rising stars: SportCruiser, EuroFox, & G-3. With one month to go before we evaluate all of 2007, here's an early picture. In eleven months, industry added 499 fixed wing airplanes plus a healthy fleet of trikes and powered parachutes. I expect SLSA registrations to reach 544 airplanes for the year, nearly a doubling of the 565 we had last January after sales were tallied since beginning in April 2005. In its first 20 months, industry registered 29 airplanes a month on average. In 2007, that number will rise past 45 a month (up 56%). 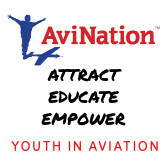 The entire airframe producer community should generate almost $60 million in sales. *** The top three remain unchanged as CTSW, SportStar, and Legend Cub held their lead even while 17 new models entered the marketplace. One of the most notable rising stars of 2007 has been CubCrafters. The Sport Cub maker started well down the January chart with only 15 registered airplanes. They've more than tripled their base of owners rising from 9th place to 4th. With Legend and Zlin, yellow taildraggers account for almost one in five SLSA. Another brand to watch is Jabiru which more than doubled its fleet from January through November (although that feat was nearly matched by leaders Flight Design and Evektor). With one month to go before we evaluate all of 2007, here’s an early picture. In eleven months, industry added 499 fixed wing airplanes plus a healthy fleet of trikes and powered parachutes. I expect SLSA registrations to reach 544 airplanes for the year, nearly a doubling of the 565 we had last January after sales were tallied since beginning in April 2005. In its first 20 months, industry registered 29 airplanes a month on average. In 2007, that number will rise past 45 a month (up 56%). The entire airframe producer community should generate almost $60 million in sales. *** The top three remain unchanged as CTSW, SportStar, and Legend Cub held their lead even while 17 new models entered the marketplace. One of the most notable rising stars of 2007 has been CubCrafters. The Sport Cub maker started well down the January chart with only 15 registered airplanes. 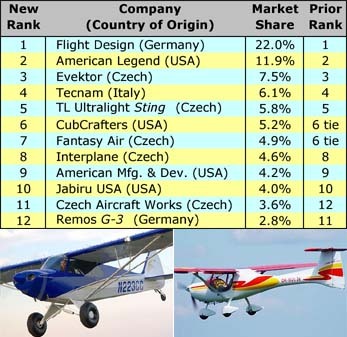 Thanks again to Jan Fridrich of the Czech Light Airplane Association for compiling the information shown in this chart. With weight shift (4 builders of 6 models) and powered parachutes (5 brands/models), total SLSA registrations hit 1,270 aircraft, exactly double the count at the start of the year. October 2007 brought another top finish for Jabiru USA. FAA registrations of J-250 and J-170 led the industry for the second consecutive month contributing to their rise in the ranks. Czech Aircraft Works logged a good increase and moved up in the chart. And, CubCrafters continued their steady climb. *** In a fresh look, this month's chart has more information. Included are the top 20 brands, counting all models by those companies (four manufacturers have multiple certifications). In addition to percentages, this month we also show the number of airplanes registered with FAA. But remember, FAA registrations do not precisely equal deliveries. Finally, due to questions about how their numbers are counted, we omitted weight shift and powered parachute LSA. *** A few observations may add to your own study of this chart. 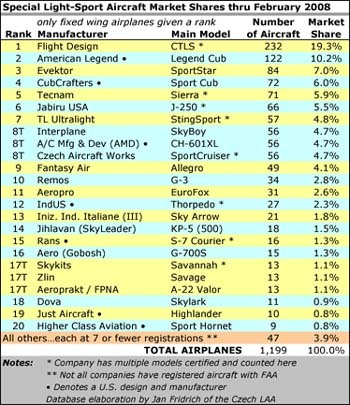 Cub replicas or redesigns from three companies added together would convincingly occupy the #2 slot with 181 registered. Little yellow taildraggers obviously have lots of appeal. And the SkyBoy and Allegro are represented by a related group. Were these two joined, they'd take the #3 spot with 95 total registrations. Finally, high wing designs account for 70% (714 of 1,023) while low wings (and a couple "shoulder wing" designs) take the remaining 30% of registrations. October 2007 brought another top finish for Jabiru USA. FAA registrations of J-250 and J-170 led the industry for the second consecutive month contributing to their rise in the ranks. Czech Aircraft Works logged a good increase and moved up in the chart. And, CubCrafters continued their steady climb. *** In a fresh look, this month’s chart has more information. Included are the top 20 brands, counting all models by those companies (four manufacturers have multiple certifications). In addition to percentages, this month we also show the number of airplanes registered with FAA. But remember, FAA registrations do not precisely equal deliveries. Finally, due to questions about how their numbers are counted, we omitted weight shift and powered parachute LSA. *** A few observations may add to your own study of this chart. Cub replicas or redesigns from three companies added together would convincingly occupy the #2 slot with 181 registered. 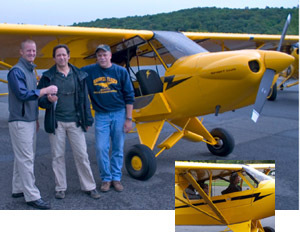 Sportsplanes.com leader Josh Foss (left) poses with Sun 'n Fun president John Burton and Dan Rozsa (right) of Mountain Aircraft in front of an American Flyer. *** This deluxe Sport Cub (bottom photo) was won by a lucky George Carley. 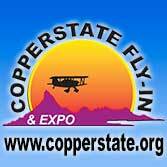 Want to win a free Light-Sport Aircraft? You missed one chance but the other is still available. Organizations like EAA, AOPA, and Sporty's have given away airplanes as incentives. Now, LSA have "arrived." *** At the May 2008 Alaska Airmen event, CubCrafters supported the organizer's fundraiser; a $50 ticket bought you a chance to win a $130,000 Sport Cub. This LSA was generously equipped and had a new red-over-white paint scheme (photo) plus the first pair of lightweight, Kevlar-reinforced, 26-inch tundra tires that are "perfect for Alaska pilots," said CubCrafters VP Todd Simmons. 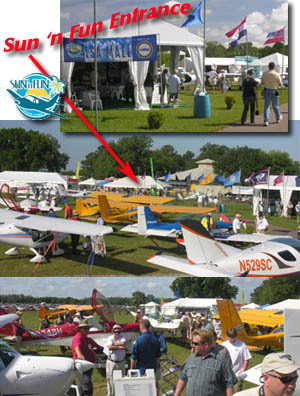 *** The LSA you can still win is Sun 'n Fun's first-ever sweepstakes airplane: a Mountain Aircraft American Flyer, distributed nationally by Sportsplanes.com who donated the aircraft with support from others including Lockwood Aircraft Supply. 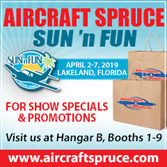 The famous Florida airshow will announce the winner on opening day of their 2008 event (April 8-14). Tickets are only $5 or five for $20 to win the well-equipped airplane valued at $79,795. 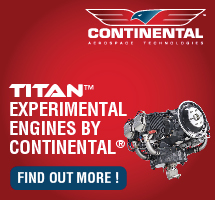 Want to win a free Light-Sport Aircraft? You missed one chance but the other is still available. Organizations like EAA, AOPA, and Sporty’s have given away airplanes as incentives. Now, LSA have “arrived.” *** At the May 2008 Alaska Airmen event, CubCrafters supported the organizer’s fundraiser; a $50 ticket bought you a chance to win a $130,000 Sport Cub. This LSA was generously equipped and had a new red-over-white paint scheme (photo) plus the first pair of lightweight, Kevlar-reinforced, 26-inch tundra tires that are “perfect for Alaska pilots,” said CubCrafters VP Todd Simmons. *** The LSA you can still win is Sun ‘n Fun’s first-ever sweepstakes airplane: a Mountain Aircraft American Flyer, distributed nationally by Sportsplanes.com who donated the aircraft with support from others including Lockwood Aircraft Supply. The famous Florida airshow will announce the winner on opening day of their 2008 event (April 8-14). As always, thanks to the Czech Light Aircraft Association's Jan Fridrich for the compilation of FAA data, a time consuming task he does faithfully each month. FAA registration data does not precisely equal customer deliveries. FAA registration data through August show continued growth with another 58 SLSA listed for a total increase in 2007 of 557 aircraft (88%) in just eight months. The lone share change in the Top Twelve was CubCrafters rising another notch to 6th, pushing Fantasy Air down to 7th. CubCrafters has been rising steadily after their late entry, though they still significantly trail rival American Legend. 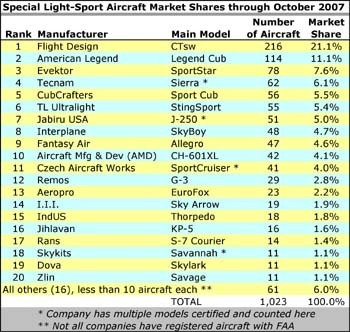 *** Despite being a trike enthusiast, I'm amazed to observe the 15% share of all Special Light-Sport Aircraft that are weight shift control aircraft. France's Air Creation and Australia's AirBorne dominate the category with a registered 105 and 61 models respectively. Six trike models share the market. *** Powered parachutes have also done respectfully well in a few months with 5% of all SLSA registrations. Infinity (27 aircraft) and Powrachute (24) overshadow Summit (7). Both weight shift and powered parachutes benefit from lower purchase prices but also from a loyal base of pilots who enjoy these unorthodox flying machines. Having flown both, I suggest you keep an open mind until you sample them. FAA registration data through August show continued growth with another 58 SLSA listed for a total increase in 2007 of 557 aircraft (88%) in just eight months. The lone share change in the Top Twelve was CubCrafters rising another notch to 6th, pushing Fantasy Air down to 7th. CubCrafters has been rising steadily after their late entry, though they still significantly trail rival American Legend. 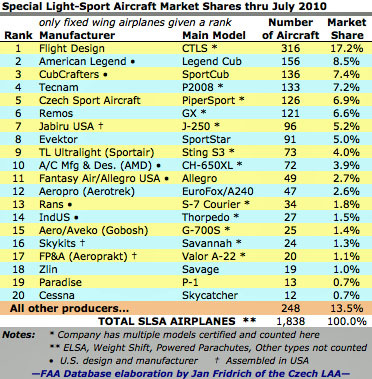 *** Despite being a trike enthusiast, I’m amazed to observe the 15% share of all Special Light-Sport Aircraft that are weight shift control aircraft. France’s Air Creation and Australia’s AirBorne dominate the category with a registered 105 and 61 models respectively. Six trike models share the market. *** Powered parachutes have also done respectfully well in a few months with 5% of all SLSA registrations. Infinity (27 aircraft) and Powrachute (24) overshadow Summit (7). High-Tech Sport Cub? Yes, Precisely. Sport Cub makes use of carbon fiber components and careful design to hold its weight down to 825-860 pounds depending on options chosen. In ASTM standards, a minimum useful load is specified, so no 2-seat SLSA with 100 horsepower may have an empty weight greater than 890 pounds. Read my pilot report in the July 2007 Sport Pilot. I admit to being somewhat surprised at the success of the LSA Cubs. We have no less than three brands with SLSA approval: American Legend, Zlin Savage, and CubCrafters. Two of these (Legend and CubCrafters) are in the top ten of Light-Sport registrations and account for an astounding one in six LSA in the USA (by itself Legend represents about one in eight). Despite a tendency to lump them together, they are distinctly different offerings. The Zlin Savage is the only one using a Rotax 912 engine and it is still selling for the remarkably low price of $60,000. Legend is...well, already a legend and can be powered by Contentinal or Jabiru. Though CubCrafters earned certification later -- despite being a Part 23 production facility -- the Continental-powered Sport Cub is the most deluxe of the trio, and is priced to match (more than $100,000 with options). But the Washington state company worked hard to keep their airplane lighter, to be sure it qualifies with ASTM standards. I admit to being somewhat surprised at the success of the LSA Cubs. We have no less than three brands with SLSA approval: American Legend, Zlin Savage, and CubCrafters. Two of these (Legend and CubCrafters) are in the top ten of Light-Sport registrations and account for an astounding one in six LSA in the USA (by itself Legend represents about one in eight). Despite a tendency to lump them together, they are distinctly different offerings. The Zlin Savage is the only one using a Rotax 912 engine and it is still selling for the remarkably low price of $60,000. Legend is…well, already a legend and can be powered by Contentinal or Jabiru. Though CubCrafters earned certification later — despite being a Part 23 production facility — the Continental-powered Sport Cub is the most deluxe of the trio, and is priced to match (more than $100,000 with options). Competition is definitely heating up for new ready-to-fly J-3 Cub replicas under LSA. American Legend earned S-LSA certification first and builds a sophisticated entry with all the right changes, and the North American Savage has a low price tag and may be substantially less costly to operate. Into this fray has jumped CubCrafters with its Sport Cub. Given the company's 25-year history in rebuilding Super Cubs, it has a shot at a good share of the market. CubCrafters also makes a 180-hp Cub called the Top Cub; its Sport Cub brochure states, "We feel uniquely qualified to redesign the Cub for the next generation." CubCrafters has not yet completed the S-LSA certification process, but it is presently the only company in LSA manufacturing that has demonstrated the ability to build to FAA Part 23 standards. That may not fairly assess those foreign builders who are participating in non-U.S. certification methods, some of which may be as demanding as U.S. government certification. 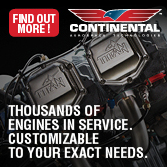 As with Legend, CubCrafters uses the 100-hp Continental O-200 engine in its Sport Cub. A 72-inch wood Sensenich prop swings in front of a fully cowled engine compartment. CubCrafters expects the empty weight of an S-LSA certificated Sport Cub to be about 825-850 pounds, about the same as the Legend Cub. Sport Cub uses components in common with its Top Cub, the Part 23 model, including the 26-G seats required in the latest amendment to that certification standard. Sport Cub also uses toe brakes to Legend's heel brakes. A standard 12-gallon wing tank doesn't offer the range of the other Cubs, though a second tank is optional. Like Legend, you can add a left-side door if you wish. 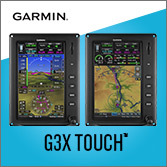 If you want to ignore Cub traditions, you can order a glass cockpit Sport Cub including EFIS, a digital engine monitor, and a GPS with a 7-inch screen. If you are moved by Sport Cub's strong pedigree from a Part 23-certificated factory, then this might be your Cub. This Washington state manufacturer does not offer the Jabiru or Rotax engine choices, but it does have an established business meeting the highest standards of the industry. At a base price of $89,500, you will pay a little more for the Sport Cub ready-to-fly, but it comes with a good basic instrument panel and a good list of standard features. Information: CubCrafters Inc., Yakima, Washington; call 509/248-9491, e-mail (sales) todd@cubcrafters.com, or visit www. cubcrafters.com. Competition is definitely heating up for new ready-to-fly J-3 Cub replicas under LSA. American Legend earned S-LSA certification first and builds a sophisticated entry with all the right changes, and the North American Savage has a low price tag and may be substantially less costly to operate. Into this fray has jumped CubCrafters with its Sport Cub. Given the company’s 25-year history in rebuilding Super Cubs, it has a shot at a good share of the market. CubCrafters also makes a 180-hp Cub called the Top Cub; its Sport Cub brochure states, “We feel uniquely qualified to redesign the Cub for the next generation.” CubCrafters has not yet completed the S-LSA certification process, but it is presently the only company in LSA manufacturing that has demonstrated the ability to build to FAA Part 23 standards. That may not fairly assess those foreign builders who are participating in non-U.S. certification methods, some of which may be as demanding as U.S.
Outside a hangar decked out with colorful balloons and company employees wearing "First Sport Cub Customer Delivery" tee shirts, two customers took delivery of their Cub Sport LSA powered by a Continental O-200 engine. Their entry has taken longer than two preceding sellers of Cub replicas under the LSA rules, but CubCrafters has taken the time to get it just right. On Thursday September 21st, the Yakima, Washington-based builder of the Part 23-certified Top Cub delivered its first two CC11-100 Sport Cub SLSA to customers from opposite coasts and starkly different environments. One will go to Juneau, Alaska and the other to Brooklyn, New York. Company president Jim Richmond thanked customers and employees who "worked and waited with us so patiently while we completely redesigned the airplane." The company announced that deliveries will now take place at the rate of one per week, increasing to two per week near the turn of the year. *** The other two suppliers of LSA Cub replicas are North American Sport Aviation and American Legend; the latter will host a homecoming for 100 customers and prospects in the third week of October. Their entry has taken longer than two preceding sellers of Cub replicas under the LSA rules, but CubCrafters has taken the time to get it just right. On Thursday September 21st, the Yakima, Washington-based builder of the Part 23-certified Top Cub delivered its first two CC11-100 Sport Cub SLSA to customers from opposite coasts and starkly different environments. One will go to Juneau, Alaska and the other to Brooklyn, New York. Company president Jim Richmond thanked customers and employees who “worked and waited with us so patiently while we completely redesigned the airplane.” The company announced that deliveries will now take place at the rate of one per week, increasing to two per week near the turn of the year. 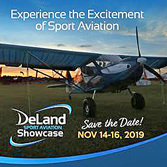 *** The other two suppliers of LSA Cub replicas are North American Sport Aviation and American Legend; the latter will host a homecoming for 100 customers and prospects in the third week of October.